As an industry leader in travel technology, Revelex is dedicated to staying ahead of the curve. From booking engines to website design, Revelex offers the products that will help you prepare for tomorrow. Join the revolution and learn more about an exciting future together. We provide software solutions for airlines, hotels, car rental companies, cruise lines, tour operators, loyalty programs, online travel agencies and much, much more! The River Cruise Booking engine is a part of the new Power Agent 5 platform and provides a complete B2C and B2B solution that allows users to search and book river cruise vendors such as CroisiEurope, AMA Waterways, Viking River Cruises, Uniworld, and many others. Ensure your website has the capability to support traditional or mobile devices. The engine is seamlessly integrated into most CRS and PMS systems so managing packaging, rewards, exclusive offers, and add-ons are simple. Faster, sleeker and more efficient than everything else on the market. Our upgraded agent desktop will dynamically change how you do business, giving agents more flexibility and control and guaranteed to increase your productivity. Come discover how Revelex is rewriting the rules for the gaming industry at the Global Gaming Expo show to be held in Las Vegas, Nevada from September 30th to October 2th at the Las Vegas Convention Center. Build the complete vacation package with True Dynamic Packaging by Revelex. This full service solution makes complex travel planning and packaging simple. Take the complete booking experience mobile with Revelex mobile solutions. Customers can browse and book the entire trip from the palm of their hand. Revelex® Power Agent™ is the industry leading desktop application that will give your business the boost it needs to successfully compete in online travel. Book air, car, hotel and cruise seamlessly from one interface. Revelex® Travel Negotiator™ is our proprietary booking engine designed to access all GDS and non-GDS systems. This best-in-class booking platform makes it easy to book air, car, hotel, cruise and tour. The Revelex booking engine will give you endless merchandising opportunities resulting in the best look to book and return on your investment possible. Tour Negotiator by Revelex gives your business the power of dynamic packaging. With Tour Negotiator you can easily build your own exclusive package of flights, accommodation, car rentals and so much more. Put the power of Revelex in the palm of your hand with Cruise Mobile by Revelex. 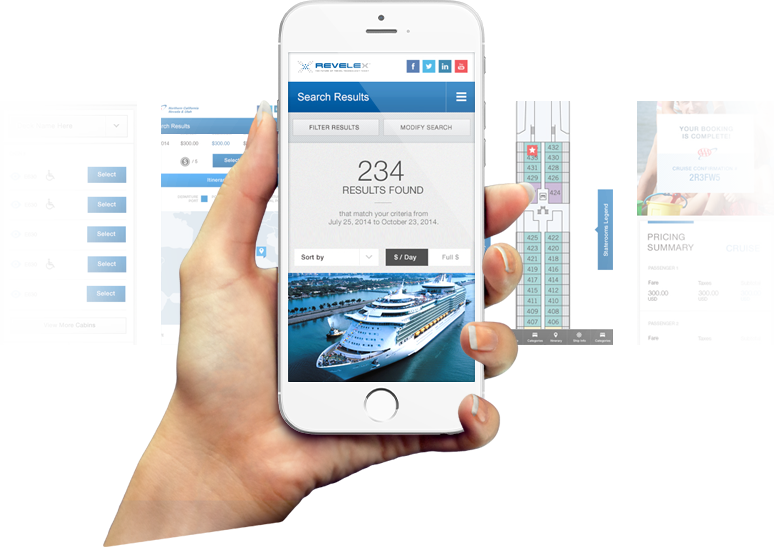 Browse sailing availability and book the cruise that suits your customer’s needs with Revelex Mobile. Clear Comp - Analysis of room availability to spend. Risk Manager - Big data made simple. Revelex® streamlines your search for the travel products your customers want. Select and configure your own targeted product mixes, including everything from the simple (limo rides and event tickets) to the niche-oriented (bed & breakfasts and wild adventure tours) to mainstream travel products (Air, Car, Hotel, and Cruises). Revelex cuts down the time and the clicks by allowing you to book it all from one interface. Keep up with your customers' needs with Revelex® Customer Relationship Management tools. Create profiles, tailor marketing and turn leads into return customers with our variety of profile matching and lead management solutions. Create a complete vacation experience with Revelex's dynamic packaging. This booking solution allows you to include discounts, mark ups, coupons and much more into one easy to understand combined price for your customers. Now available in Cruise plus Air! Revelex® provides a one-of-a-kind digital travel marketplace that helps you unleash the full potential of your business. We can provide you with a private-label website that lets the world know you're there and easily helps you reach new markets and expand existing ones. Give your customers the choices they crave with Revelex® solutions. We offer a comparison shopping tool for all travel products for finding the best deals. Interactive mapping makes choosing a hotel close to the action an option for customers and they can choose e-ticketing for flights. Give your customers the reward of redeeming points with Revelex® solutions. Our customizable loyalty and redemption solution offers you the flexibility to designate which products can be bought with points and gives customers the option to acquire points if they book with you. Revelex and CroisiEurope enter into distribution agreement. Europe’s Leading River Cruise Line to be available in the Revelex Cruise Platform for both agents and consumers. Revelex Corporation, a leader in travel technology solutions for travel sellers, unveils a new and improved corporate website.